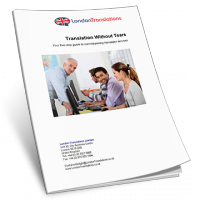 London-Translations.co.uk provided us with an absolutely superb service. The translations they provided were excellent, the speed in which they delivered was remarkable, and above all the communication was fantastic. It was fast, friendly, and frequent, I really couldn’t have asked for much more. On top of all that, it was a bit of a bargain too! We shall certainly be a returning, and I can recommend them with confidence.